The new-look SuperCup NI kicks off in Ballymena this week with a first in the tournament’s history. The opening ceremony of the competition - formerly known as the Milk Cup - takes place in COleraine this Sunday night, when it will be launched by actor Jimmy Nesbitt. But before then, an Under-21 event will kick off the SuperCupNI on Thursday July 21, with two semi-finals. They will include an historic first ever appearance in the competition from Glasgow Celtic, who will tackle Spaniards Real Sociedad at Ballymena Showgrounds while Everton meet Espanyol at Coleraine the same evening. Both games start at 7.30pm. The two losers will feature in a 3rd/4th place play-off at Ballymena Showgrounds on Saturday July 23 (2.30pm) , followed by the final (5pm). The first appearance by the Parkhead club is another coup for the competition as it begins a new era. New Celtic boss Brendan Rodgers has been a long-time supporter of the tournament right up to his time in charge of Liverpool. Once the action gets underway, local attention will focus on Ballymena boy Lee O’Brien as the sole representative from this area in the County Antrim set-up. 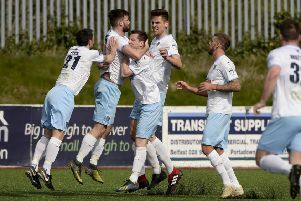 The former Ballymena United Youth Academy midfielder, who now plays for Cliftonville, will be hoping to emulate Antrim’s remarkable success of last year when they became the first county side to win the prestigious trophy.